My super fresh and seasonal grilled asparagus salad (as seen on Country & Town House) is a great way to make the most of this hero vegetable whilst it’s still in season. My secret to a good salad is to have FUN with your garnish: go nutty, get seedy, be cheesy and add savoury yoghurt for a hit-the-spot dish that’ll leave your guests hungry for more. 1. Put a medium pan of salted water on to boil. Once boiling, blanch the peas until the first few float to the surface then immediately plunge into ice cold water (this retains the vibrant colour). 2. Wash the asparagus and break off the woody stalks. Slice lengthways and toss in a glug of olive oil. Char on a griddle pan until nicely marked. Once cooked, cut each piece in half. 3. Zest the lemon into your preferred serving bowl/platter and add the juice along with 2 tablespoons of olive oil. 4. 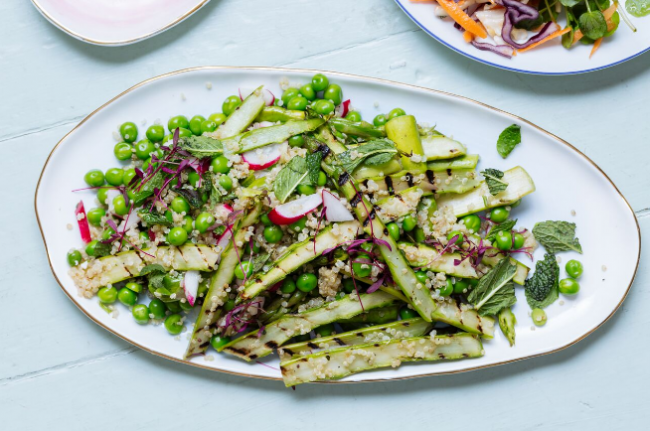 Add the quinoa, peas, radish, charred asparagus and mint to your bowl and season well with salt and pepper. Mix gently until fully combined – you can add crumbled feta at this stage for another depth of flavour. 5. Serve on a beautiful plate and enjoy!